OBERLIN, Ohio — Firelands High School students spend their downtime between classes a little differently than most high school teenagers. They are not bent over their phones, texting or snapping. Instead, with a skein of yarn and hook in hand, they crochet blanket squares. These high school students — boys and girls alike — have taken up the lost art that is crocheting. At Firelands High School, in Oberlin, Ohio, crocheting is the cool thing to do. Firelands FFA President Mike Anadell (right) helps Firelands High School student Sam Dempsey get started on a crochet project. The idea to launch Crocheting for a Cause through the Firelands FFA chapter came to senior and current chapter Vice President Katy Tuggle while she was talking with her mom one evening. Her mom, an avid crocheter herself, had taught Tuggle. “I started thinking, we could teach other students how to make these, and they make great gifts,” said Tuggle. 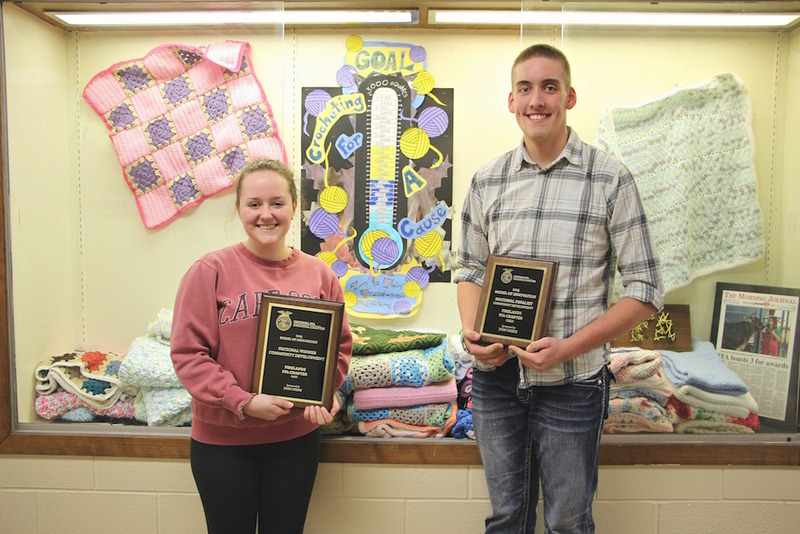 “When you hear ‘Crocheting for a Cause’ it makes you ask, ‘what is that all about?’” said Ohio FFA President Matthew Klopfenstein, who visited with the chapter earlier in the year. “But they are really thinking outside the box,” he said. It may not be a typical FFA community development project, but it earned their chapter the National Model of Innovation in Community Development at the 2015 National FFA Convention. 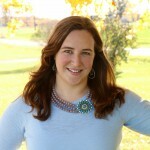 “When (Katy) approached us last year, I was very skeptical,” said Shanna Finnegan, chapter adviser. “How many high school students are really going to be interested in crocheting?” she said. The idea was presented to the officer team who also expressed a similar skepticism. “You often think of the stereotypical grandma (when you think about crocheting),” said Mike Anadell, senior and current chapter president, who had actually learned to crochet from his grandmother. Firelands FFA Chapter was named National Model of Innovation in Community Development at the 2015 National FFA Convention. Katy Tuggle and Mike Anadell headed up the chapter project, Crocheting for a Cause. So the chapter decided to give it a shot. But as Finnegan suspected, when the sign-up sheet was posted in the hallway, only a handful of girls had added their names to the list. Then one senior boy — who Finnegan described as being a popular student — walked up and added his name to the list. And just like that, crocheting became the cool thing to do. “It was a huge surprise to see (students) get involved,” said Finnegan. The participants were evenly split between girls and boys. The chapter ran announcements in the local paper and sent emails to community members about the project and received an outpouring of donations, from skeins of yarn to hooks and even money to purchase supplies. 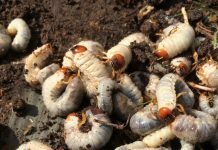 “For three months, we would walk into the ag room and (our adviser) would say, ‘we have another bag of yarn,’” said Tuggle. The only thing they had to purchase were some hooks to get started, which they were able to purchase from monetary donations toward the project. 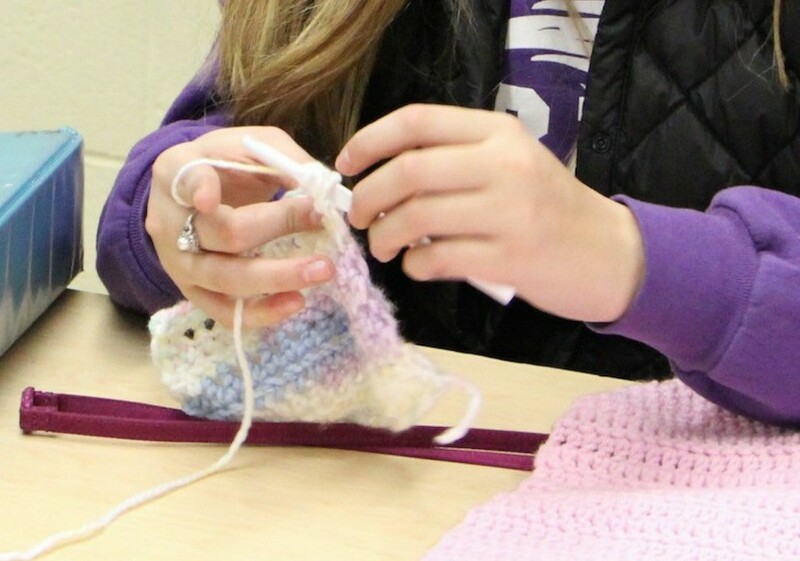 A couple days a week for four weeks, FFA members, students and community members gathered in the agriculture education room to learn to crochet, explained Anadell. For the duration of a Christmas movie, people crocheted and enjoyed each other’s company. Anadell’s grandmother and mother, Tuggle’s mother and other students’ parents who knew how to crochet helped new crocheters get started. Both Anadell and Tuggle said it is very easy to get started. After four weeks, Firelands FFA had 71 handmade items including blankets, scarves, hats and headbands. They donated items to local families and the Genesis House in Lorain. Students carried plastic bags of yarn with them from class to class and would crochet in their downtime. Some would even pull out their hooks and yarn during class. “As long as they were paying attention during class, they could crochet,” said Finnegan. Teachers would even send students down to the ag room to pick up yarn and hooks before they served their detention. “It caught on like wildfire,” said Tuggle. After four weeks, the chapter had 71 handmade items including blankets, scarves, hats and headbands. They gave some of the items to three families they were sponsoring and donated the rest to the Genesis House in Lorain. 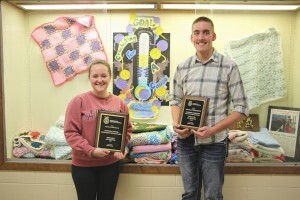 “I like the idea that a family is enjoying a blanket that I made,” said Macey Butchko, a Firelands FFA member. Butchko learned how to crochet with the group from the beginning of the project and found it to be fun — and addicting. “I sit at home and think about it … I need to get this done,” she said. In December, Firelands FFA held a leadership night where they presented Crocheting for a Cause to 111 FFA members from five local chapters. They gave each attendee starter packets and taught them how to crochet. “We encouraged them to learn it and take it back to their schools and communities,” said Tuggle. “But I found that it is really not that hard at all,” he said, adding he actually enjoyed the experience. He was given his own set of crocheting starter packets and was challenged to teach other schools how to get started. Grace (left) and Sophia Pohorence, Firelands High School students, are identical twins born with twin-to-twin transfusion syndrome. As part of a girl scouts project, Sophia is working with the Firelands FFA Chapter and their Crocheting for a Cause project to make blankets for newborns with the syndrome. So far they have made 40 blankets out of the 100 that is Sophia’s goal. Recently, the chapter has taken on a challenge from a fellow classmate who wants to donate blankets for a cause of her own. Sophia Pohorence and her sister, Grace, are identical twins, but Sophia appears a little smaller than her sister. They were born with twin-to-twin transfusion syndrome, which Sophia explained is where one twin receives more nutrients in the womb than the other. Sophia wants to donate handmade blankets to newborns with the syndrome. Crocheting for a Cause is helping Sophia make the blankets for her care packages, and they have already completed 40 of the 100-blanket goal. If you are interested in donating supplies or making a monetary donation, email chapter adviser Shanna Finnegan, sfinnegan@firelandsschools.org. If your chapter is interested in getting crochet starter packs and learning to crochet, contact Finnegan or Ohio State FFA President Matthew Klopfenstein, mklopfenstein@ohioffa.org.